SKOWHEGAN -- The wife of Eaton Mountain Ski Area owner David Beers left an answering message on her cellphone Monday, a day after her husband was injured seriously in a mechanical accident on the mountain. SKOWHEGAN — The wife of Eaton Mountain Ski Area owner David Beers left an answering message on her cellphone Monday, a day after her husband was injured seriously in a mechanical accident on the mountain. “I love you guys — Dave’s doing well and they’re taking very good care of him,” Donna Beers said in the message posted at 2:35 p.m. from Eastern Maine Medical Center in Bangor. 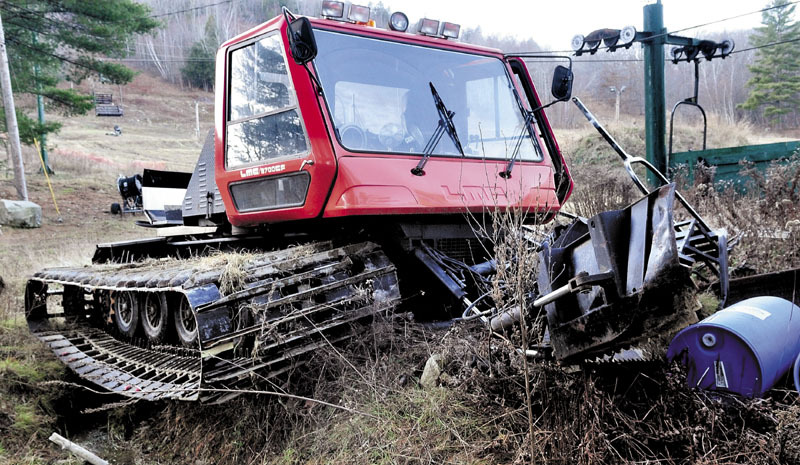 Donna Beers said earlier in the day Monday that her husband was undergoing surgery on a dislocated ankle and had suffered a broken jaw after he was run over by a snow-grooming vehicle on Sunday. Other than some minor cuts and bruises, that was the extent of David Beers’ injuries, despite the fact that an 18,000-pound groomer rolled over him, she said. David Beers, 40, and another man were trying to fix a track on the vehicle when it accidentally slipped into gear, onlookers said Sunday. He was conscious and answering emergency medical technicians’ questions before he was taken by LifeFlight helicopter to Bangor. Donna Beers said she and her husband have every intention of opening the ski area to snow-tubing this year. The mountain, with a new handle-tow lift, opened for the first time last winter following a fire that closed the place in 2005. The couple, from Wallingford, Conn., bought the business in 2007 for about $400,000. The business remained closed for two years while the couple made repairs and maintenance upgrades. Last year, they opened the mountain and a new snow-tubing park after investing about $100,000 to install a new handle-lift, lights for nighttime activities and snowmaking devices. Eaton Mountain has 18 potential trails, with a double chairlift. The mountain’s chairlift for skiing and snowboarding are expected to open soon, but not this year. Snow-tubing includes three groomed chutes, with sculpted sides and rolls and bumps to make the ride exciting. Donna Beers said they had a good year last winter with the snow-tubing park. She said she realizes how important a local ski mountain is to a small community. Ron Bonnevie, grant director of the 21st Century After School Program at Skowhegan area schools, and Denise LeBlanc, director of Skowhegan Parks & Recreation, both said their students used the snow-tubing park last year and anxiously await the opening of the ski and snowboard trails and chairlifts. LeBlanc agreed, saying the Recreation Department’s Outdoor Adventure Program relies on places such as Eaton Mountain Ski Area to get children outside in the winter. Last winter the program had 20 students signed up, she said. Greg Sweetser, executive director of the trade group Ski Maine Association, said he has met David Beers several times and admires his work. He said there are 20 ski areas in Maine, with about a dozen small, community areas, such as Skowhegan’s Eaton Mountain.